Get a cup of coffee or a glass of wine- this is going to be the longest post I’ve ever written. Genealogy has been a passion for me for almost 25 years- and an interest of mine since childhood. I am an only child, who was blessed to have three of my grandparents living with our small, quiet family for much of my childhood in Chico, California, where my father had his dental practice. A desire to know how our family connected with others, plus an interest in history, led me to finally start actively researching my family’s ancestry when my daughter left for college in 1992. My father had died ten years earlier at age 80, and I began to realize I needed to find out the answers to all my questions before my mother and father’s generation was gone. This was the days before internet research, so I started writing letters and doing research at LDS libraries. I was hooked. Flash forward to January of 2015: Most of my family lines go back about as far as I can take them, I’ve met many cousins online, and my genealogy is now uploaded to ancestry.com. Last week, I was sitting at my computer idly looking at the leaves on my parents’ branches of my online tree. The leaves are placed on an ancestor’s name when Ancestry’s computer finds a record or family link to someone in your tree, and, since I thought I knew all about my parents, I hadn’t looked for information about them very assiduously. When I clicked on my father’s name, there were several clues about census records I already had, as well as his death record. Then I noticed something new. There was a link to a Find A Grave record. Find A Grave is an internet site that indexes cemetery records- very useful for genealogists. My mother and grandparents and many other relatives and ancestors can be found on there- but my father should not have been listed for reasons I will explain shortly. When I clicked on his listing- there was my father- correct name (with the middle name misspelled), correct birth and death dates, and correct rank in the U.S. Navy. He was interred at the Northern California Veterans’ Cemetery in Igo, California (just outside Redding). I was in shock. My parents were very private about anything related to death. As a young adult, I had never known (or even thought about) where my grandparents’ resting places were. There were no graveside services or visits. It wasn’t until my mother was near death and we had to start thinking about her arrangements, that my husband made some calls and discovered that my grandparents’ ashes were at a cemetery in Chico, where they had lived their final years. However- we knew that was not the case with my father. When my father died suddenly in 1982, my mother said that he was to be cremated, and that his ashes were being scattered at Lake Almanor, where he and my mother had spent many happy times in their retirement years. I cannot remember the conversations exactly, but both my husband and I remembered that this was to be done by helicopter or plane. It never occurred to me to think that this had not been accomplished. I was a busy mom, with young children, lived 100 miles away, and was still at the stage of not questioning my mother’s decisions and or taking charge of her affairs. Besides, I thought that Lake Almanor was a fitting resting place for him, and was happy knowing that’s where he was. So. . . last Monday, after finding that my father’s ashes were at a veterans’ cemetery instead of scattered at the lake, I called the cemetery. I cannot begin to say enough about how impressed and grateful I am with the speed at which everyone concerned called me back and the care that was taken (with me- and with my father’s remains). I was called FOUR times that day by various people involved in this story- and I had my answer. Here’s the story: amazingly, my father’s ashes remained at the mortuary from 1982 until 2009. In 2007, a group called Missing in America had been formed to find unclaimed remains of veterans, search for relatives, do the necessary paperwork, and place their remains in a veterans’ cemetery with a full military service. My father’s remains were discovered at a funeral home in Chico- and the only information about him was a piece of paper in his urn with his name and birth and death information- no instructions for the ashes. 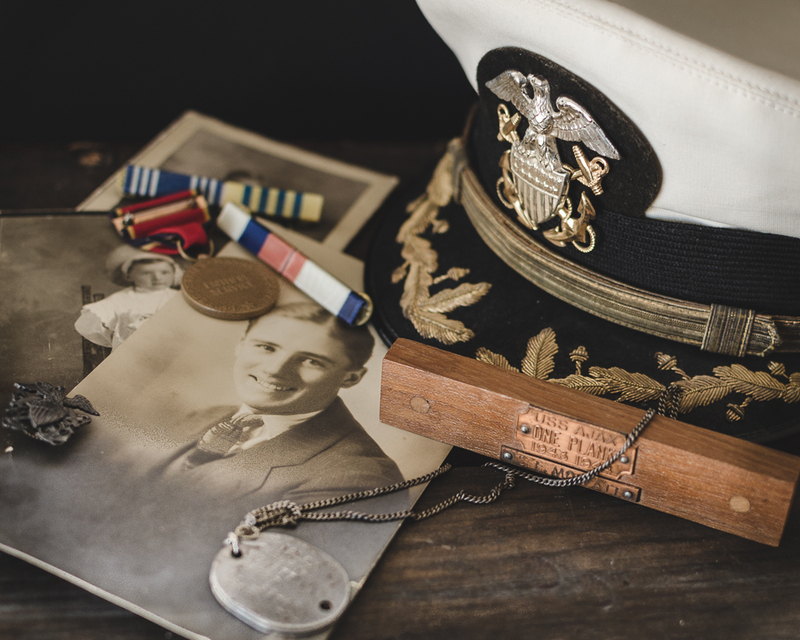 Since he was a World War II veteran, Missing in America took charge of his remains, placed a notice in the local paper asking for relatives to contact them, and filed the necessary paperwork with the V.A. Twenty-seven years after his death, my father was laid to rest on November 18, 2009 at the Northern California Veterans’ Cemetery in Igo. Several people have asked me how I feel. It’s only been a few days, but I can say I feel grief, guilt, sadness (and have shed lots of tears)- but also immense gratitude to Missing in America for taking care of my father- and many others- all across the country. I cannot place blame- I don’t know how or why this happened. Knowing my mother, she may have been too shocked or upset to follow up on the scattering of the ashes. Or perhaps it was neglect on the part of the funeral home- or whoever was to do the scattering. But, according to Missing in America, this situation is all too common. And, of course, we’re not just talking about veterans. The genealogist whom I had spoken to from Missing in America went to the cemetery Wednesday to take photos for me- and is sending me photos that were taken at my father’s service. There was a TV news crew at the service as well; it’s possible there may be video available. I have signed up to be a volunteer genealogist with Missing in America and to take photos of graves for Find A Grave. My hope is that my interests in genealogy and photography will come together to help other families like ours. Linking to Kim Klassen’s Friday Finds. This entry was posted on January 16, 2015 by Melinda. It was filed under family, Friday Finds, still life and was tagged with ancestry, genealogy, grave, navy, unclaimed, veteran. What an amazing story, Melinda, I can only imagine your feelings! I too just recently got a “Leaf” on one in my family line from FindAGrave…not only did it give me information on the cemetery he is buried in but automatically added the site to my sources!!! Probably not too many people would be thrilled about that but I sure was!!!! Feeling grateful you shared this news and I am. in awe of you. To read your story, with each of your emotions shared at every turn, is so generous of you. And then, at the end of the post, your decision to volunteer for the organization, as a photographer, is profoundly moving! My head is spinning. Such a moving story Melinda — and so sensitively told. I really admire your desire to volunteer your photographic talents to this organization. Hats off to you. Amazing and bittersweet…thanks for sharing your story. It’s just like you to reflect on your experience and take measures to make a positive impact! That’s amazing Melinda , I am glad that Missing in America came through and I wish you luck in your venture to help others find closure. Wow… thank you for sharing such a heart touching story. Our daughter is a Funeral Director and I am going to share your story with her. What a beautiful photo too! Melinda, I’m so glad you posted your story on your blog. You have written a beautiful piece. People need to know what happened and that there are kind and generous people out there (including you) who take the time to help others. The memorial photograph of your dad is really nice and a fitting tribute to him as a Veteran. Plus, I can really see the resemblance. Wow!! What a story! Life is full of surprises. Melinda! How startling to find all this coming to light since the new year. Your dad – I just know he would be so proud of you. I feel drawn in to the turns and mystery and familiarity of your family’s life, and this part, after life, this continuing life, too. It seems a little as if you were brought through these surprises to arrive where you are called to be. How radiant your decision to help others with your talents, understanding, and love! Great post! Awesome family history Friday Find! Stories like these are why I’m so hooked on genealogy too! This is a deeply moving account of your father’s journey to his final resting place. You are an amazing person to have discovered what happened, and now to be volunteering with Missing in America … how inspiring!